I started making the older girls do the dishes every day. Avery unloads. Savanna loads. They both complain. I used think of it as their job but do it for them if they weren’t nearby, weren’t in good moods or it was easier to do it myself. In other words, I did the dishes. 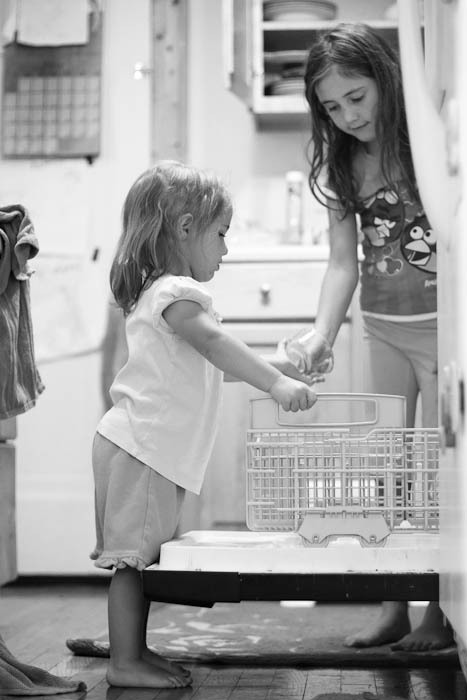 This summer I noticed how many more dishes get used when everyone is home all day and how very capable my girls are. Now when dishes are piling up, I call the girls and keep after them until they get the job done. There is squirming and whining but eventually it gets done – and not by me. There is a little light in the tunnel of discontent. “Yes! I do!” chirps Augusta. I love this one. They both look so sweet.